Jul 25, 2017 at 09:27 AM | 195 Views | Last edit Jul 25, 2017 at 12:21 PM 3 rev. 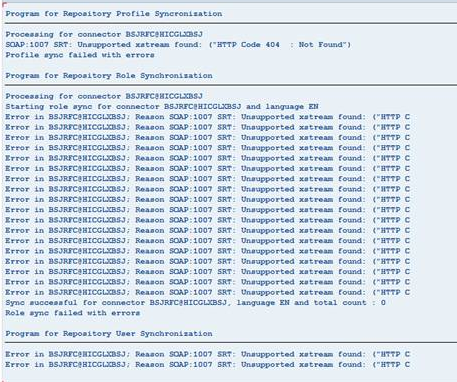 i am cofiguring EP provisioning in GRC AC 10.1.
when i try to map portal connector with AUTH scenario i can able to see only options for WS, HDB, LDAP, SAP but i need to add SPML1 which is not available and when i try to add it manually its showing customer names space issue. can you please help me on it. it happened due to RFC issue and after correcting its working fine. SPML connector can still be added for AUTH scenario, and you can manually add the type SPML1 within the AUTH scenario with class name as CL_GRAC_AD_ACCESS_MGMT_IDM_OB. Did you create the Connection Type Definition in SPRO for SPML?I hope you have created two RFC's for SPML and WS as per the GRC AC EP integration Guide. thank you for your valuable input and i fixed the issue by entering manual values. but i am getting below error while executing repository sync job, could you please throw some light on it to fix the error.